Posted in Weight Management on July 6, 2012. Last modified on March 28, 2019. Read disclaimer. Did you know that as your body fat goes up, so does your risk for heart disease? That's especially troubling considering that 78 million Americans are considered obese. Body mass index (BMI) is a calculation involving your height and weight. BMI typically correlates with body fat, but because it doesn't actually measure body fat, it may not be accurate for everyone, especially those with a more muscular body type, such as athletes. 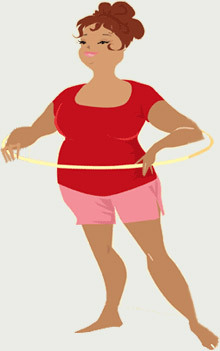 In adults, a BMI between 25 and 29.9 is considered overweight; a BMI of 30 or higher is considered obese. To learn your BMI visit the Adult BMI Calculator at the US Centers for Disease Control. Measuring your waist circumference is another helpful gauge. Standing relaxed, exhale and measure around your bare abdomen, just above the hip bone. The tape measure should be snug but not tight. As your body mass index goes up, so does your risk for coronary heart disease (CHD) and heart attack. CHD occurs when a substance called plaque builds up inside the arteries. This can narrow or block the arteries and reduce the blood flow to the heart. This can lead to angina (chest pain or discomfort) or even a heart attack. Overweight and obesity can also result in high blood pressure. High blood pressure is twice as common in obese adults as in those at a healthy weight. Additionally, obesity is associated with elevated triglycerides and decreased HDL (good) cholesterol. The news isn't all bad: According to the United States Office of the Surgeon General, a weight loss of 5-15% of total body weight in an overweight or obese person reduces the risk factors for some diseases, particularly heart disease. Weight loss can also result in lower blood pressure, lower blood sugar and improved cholesterol levels. In addition to maintaining a healthy weight, you can also help protect against heart disease by eating a healthy diet that includes plenty of fruits and vegetables, exercising at moderate intensity for 30 minutes most days of the week, not smoking and limiting the use of alcohol. Read tips for losing weight. They seem to be suggesting that the bacteria in our gut may not only dictate the foods we crave, but may also influence our dopamine and serotonin levels. That is a great article, Jake. As someone who NEEDS dark chocolate frequently throughout the day, it never dawned on me that I may be feeding an ever-growing chocolate-craving bacteria population in my gut. If this article is correct, nurturing the &qote;desireable" bacteria might be a powerful tool in helping us to manage our eating behavior. Likewise, I suppose it wouldn't take long before food chemists to find ways to make us crave certain brands of foods or fast food restaurants.